My brother owns a theater company. He sends out pairs of actors all over the country to perform in plays based on literature and historical events. They wear uniforms with the company logo. They drive the company vans which are registered to his company in NC. They carry around company Rubbermaid bins, you know the type, but in this case they are not filled with your old high school year books and winter clothes but props and costumes, wigs and puppets. These folks are actors, some with years of experience, some right out of college. Acting is a tough career, like a lot of artistic endeavors. His actors come from Broadway sometimes and they go to Broadway sometimes. You work gig to gig. You do it because you love acting. He pays well above what his competitors pay their actors and it is in fact a living wage. He’s a good, ethical man, my brother. Two nights ago, he got a call. His actors were traveling through a town in NC when they got pulled over by the cops. Broken taillight, they said. (The next day a mechanic assured them the taillights were a-okay). They were questioned. When the cops said “it didn’t add up” (theater people traveling through their small county on their way to do theater stuff), they called for back up. More cops came. These are theater majors. The cops were looking for something to nail them on. They searched through smelly wigs (sorry, bro), costumes, sets, ancient hats, vests and frilly dresses. They wondered aloud where the drugs were. You know how on a long ride as the passenger, you like to kick off your shoes? Well, so do some actors apparently. Its a pretty normal thing to do. That means that when you are told to get out of the vehicle by a cop and its night time and you are Black, you cannot put your shoes on because it feels like you are going to get shot. This actress was thus barefoot, hands against the vehicle alongside her male colleague while three cops dug around their sweaty costumes trying to piece together the big mystery of how there are a. )actors b. )in a van c.)traveling through their town. Of course, there was nothing. These are professional actors. They had places to go and things to do. They were probably ready to hit the sack at that night’s hotel, call their friends back home and call it a night. Clues such as their uniforms or pay stubs or the paperwork regarding that day’s shows and tomorrow’s shows were inadmissible evidence at that point. They wanted to call the (White) owner of the company which employed them but he was an inadmissible witness. The actors were shaken up by the time they called my brother and they were back on the road with their nothing-wrong-with-it taillight. He was shaken too. The shows they are touring with right now are about the Civil Rights movement. The next day they hit the road again and performed the shows again. The show must go on, as they say. My brother has said he’s going to do something about this. Do you expect Black people to be guilty? I have anecdotal evidence of having been in situations, one with White associates and one with Black associates and I can tell you first hand that people look at the Black people and just expect that they are up to something or that they are guilty. Why do they/you/we/I do that? What does this have to do with St. Francis? St. Francis stepped across the lines that divided people (haves from the have nots, Christians from the Muslims) and just sat down to eat with people, to have conversations with people. If you are reading this and you are White, answer me this: do you believe in integration? If so, when was the last time *you* integrated someplace? A Documentary in 40 Days (share your story)! It all started with an idea that had been percolating for awhile. Then came the news about a mini grant from National Catholic Sisters Week. Next thing I knew, I was awarded the grant to put together a documentary which is a collection of stories (small, medium and large) from a wide variety of people across the country. The stories tell about Catholic religious sisters and nuns who have served the poor. Let’s talk. I want to hear your story! awake in the late 1980s, you’ll remember the huge scandal involving Jim and Tammy Faye Bakker. They were popular televangelists who raked in millions of dollars per year with their tv channel. The money, it seems, came mostly from elderly retired people on fixed incomes who watched the channel incessantly, parting with their money as the smiling faces of Jim and Tammy Faye assured them it was all for the Lord. Well, naturally, when you have that much money coming in, surely the Lord doesn’t need it all and it would be good to spend it on some little treats now and again (oh, and as hush money over a sexual assault)(oh, and on pyramid schemes). I mean, doesn’t that just look like as much fun as the Charlotte Funny Bus? Water park which, as it turns out, probably would have permitted Catholics. away) so when my parents took us on a drive-by of Heritage USA back in the 80s, I think they got out of paying for water park tickets by telling us they didn’t allow Catholics there. Lol. Good one, mom. Anyhow, as far as I know, we escaped unrobbed by the Bakkers which was a rare feat in those days. You may remember stories of their air conditioned dog house, six homes, and enough gold plated fixtures to inspire the Enron thieves years later. Self-identifying Christians of all stripes flocked to this Mecca of Tacky and found many opportunities to spend their money while there. I married into a family which has some curious Heritage USA connections. My adorable husband went to the high school which was the remnant of the one founded by Jim and Tammy Faye. He went there post-scandal so the population had dwindled to just 12 per grade. He often brags that he graduated in the top 12 of his graduating class. Oh, and he played three sports (everyone had to). The family connection to Heritage USA I’m most proud of his the fine work of his uncle who was a U.S. Marshall. This scam-machine of deception called PTL (Praise the Lord) Ministry was shown to the world by a Charlotte Observer reporter who won a Pulitzer for his fine work. The veil was lifted and it turns out some very un-Christian shenanigans were going on under the gold-painted roof and fake skies (see photo) of “Main Street, USA.” These include affairs and I don’t just mean business affairs, sexual assaults and lots and lots of money being bilked from people. They sold off shares for $1000 apiece which enabled “donors” to spend 1 weekend per year for all eternity at Heritage USA. Guess what? Those donors were mostly elderly people with little money as it is. Well, problem is they sold more shares than units and didn’t even finish most of the building projects. 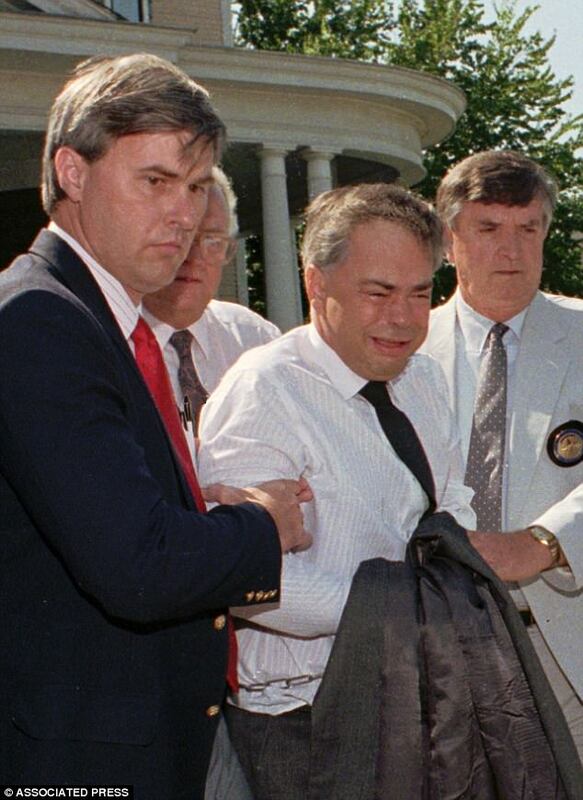 Oh, but about my husband’s uncle: he served as a U.S. Marshall and is the one most prominent in the photos hauling ole Jim Bakker’s thieving bottom on the perp walk after his arrest. He’s a classy guy, this uncle, so he gave his coat to cover the ‘cuffs on this once-hailed, now-found-out-thief (who, by the way is from Michigan, not North Carolina). That really was a classy thing to do-gracious even. I was invited years ago to gaze upon various items related to this momentous arrest and was thrilled to my core by them! As I walked around this now-refurbished building which houses the faux Main Street, I snapped photos, felt indignant about the whole ripping-old-people-off thing and wondered about the Bakkers’ own journeys through grief and rebuilding and coming to terms with what they got caught doing. Mr. Bakker admitted he was wrong, even wrote a book with the sing-song title I was Wrong and said in a TV interview shortly after being released from prison that, upon further reflection, he realized that Jesus didn’t really have too much good stuff to say about money grubbing after all. Granted, he said this while in a lovely home in Malibu listening to the waves crash under a particularly spectacular sunset (I’m guessing here), which makes the whole living simply and eschewing money grubbing thing a lot easier to stomach, but still, it is a step in the right direction. One of many never-finished buildings from which huge chunks of bricks regularly fall into the parking lot below. Maybe after having fallen into ruin, certain entities and people have to go through a purification to come out cleaner on the other side. I’m not thoughtful enough to come with ways that this actually is a story of redemption. I see that Jim Bakker is doing his old shtick, preaching on TV for money, but I mean, come on, I have to assume he’s going about this the right way this time. I will say that it’s a good thing that empire of tacky fell into ruin in the first place before more people were victimized by them. Sometimes stuff falls into ruin and that’s just the way it has to be. I guess our hope as Christinans is that the falling into ruin part is not the whole of the story, but is the beginning of a new story, one which moves beyond ruin into something even better than what was there originally. A Malibu Sunset…this oughta help.